If you've followed my blog for awhile you'd have noticed my little series of Anxiety & Me posts, In my last update I mentioned having a 6 week course of CBT therapy and how well things had turned out despite my doubts at the beginning. During that time one of my aims was to get myself a job or at least apply for a few without having a total meltdown, well since then I have applied for many jobs confidently sadly nothing came of the majority of them and the 3 interviews I had didn't mount to anything either. After a little while the job centre told me about a work programme with M&S through the princes trust. I went along to the first information day not showing any major enthusiasm not knowing the experience would be absolutely life changing for me, With all the information in hand I went along to the second information day and a taster day at one of my local M&S stores were I met an amazing group of people. We had a run down of what the next 4 weeks would involve and done some group exercises something which a few months earlier would have sent me into a complete meltdown. Then came day 3 where each of us had to wait for the phone call to see if we were successful with getting onto the programme I was one of the 18 lucky people to have made it onto the programme and had secured a place in my first choice of store to complete it in. My time at M&S during my work experience has been an amazing journey, I've made some amazing friends, I've had hands on experience with the general day to day of retail, Things my heart was always in and already doing but my mind was so scared of doing. Finally being given the chance from a company that saw my struggles and saw something in me I didn't entirely believe I had myself. 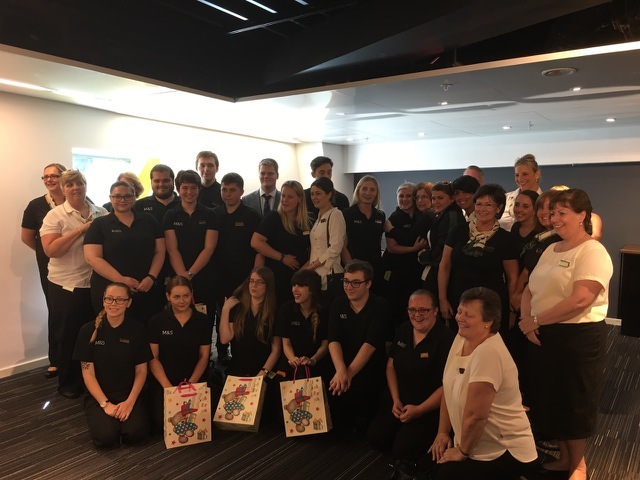 4 weeks of great work experience and an emotional celebration day with everyone involved. I returned back to the store in which I completed my work experience in. Sat in Enrica the store managers office along with Nina who has been my work bestie (who was also part of the programme) and two of our amazing coaches Angie and Jon. Where both me and Nina got the news they had decided to keep us on!!! Your now reading the blog of a newly working mummy who can be found in the GM section of Marks & Spencer.